As of 10/19/2009 Jango Desktop is going open source. Please check out the project at http://code.google.com/p/jango-desktop/ and jump right in. Programmers, graphic designers, or just your ideas, whatever you skills may be you are welcome to join the fun. Run from system tray only (Minimize to tray, double click icon to bring the window back). I am a big fan of both Pandora, Jango and streaming music in general. I think they are great. However I also feel that being a web based application they lack features that exist in a desktop media player. For example keyboard shortcuts and notifications are features I cannot live without. I found that there is a desktop application for pandora that tries to remedy some of Pandora’s flaws. It is called Pandora’s Box developed by Daniel Mackey from http://cdfan.com for Jango there has been nothing until now. You can read all about updates and bug fixes here if you are intersted. Do you like my work? How about buying me a coffee? FamFamFam.com – I use many of the icons in my project. for testing the and finding bugs in the application. Jango Desktop is no way affiliated with www.jango.com. By downloading Jango Desktop you claim full responsibility for the use of this application. Is there a project by you to make a Jango Desktop for Linux? At the moment no. I have never done development for Linux. However I plan on cleaning up Jango Desktop’s code and releasing a new version soon(maybe a week or so). I may also release the source code/make it an open source project. Maybe someone in the Linux community will port it over. If you know anyone that is interested let me know. Awesome application, I’ve been using it without any problems for the past few days. It’s really easy to install (and updates are installed automatically), and makes it easy to listen to and control music without having to use a web browser. I have got Vista 64-bit and I can’t listen to the music. I log in but then, appears an window then i have to install Adobe Player (however I already have) and I click to install but nothing happens. Why ? Pls help it’s great application but I can’t use it. Knowing nothing about your system, I am just guessing at what might be the problem. My guess is you do not have flash installed for Internet Explorer(you probably use something like Firefox or Chrome which have their own versions of flash), my program uses a Web Browser controls which in the end is pretty much Internet explorer as I use the .NET framework. My suggestion open Internet Explorer separately then go to http://get.adobe.com/flashplayer/?promoid=BUIGP and install flash from the IE browser. Once installed try Jango Desktop again. I tried but finally I saw that I have to versions of IE on my PC. First 32bit and the second 64bit, your program is using 64 bit version, but Flash Player not supports 64 bit version of IE !! Here’s the problem. 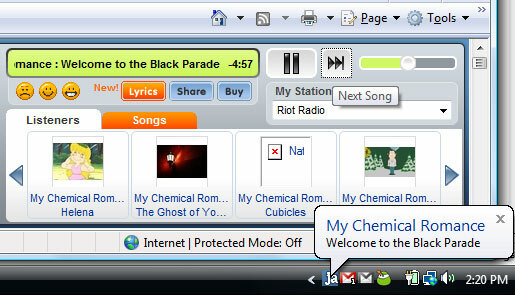 But If i can change the web browser which is used by your program I would listen to the music, but is it possible ? Thanks for the answer. @Kapa I have recompliled Jango Desktop into a 32bit application forcing it to use the 32bit browser control. Your problem should be fixed now, however by switching the platform type I broke auto updating, so you make the jump to the newest version you should uninstall all current versions and resinstall the newest version. If you could get me know if this works or if you still have issues that that would be great. It’s working now, thanks a lot. I also have an idea, your program is very useful but I think that it will be great If you make a keyboard shortcut for “next song” button. Hope to see new version soon, thanks a lot. How about adding ‘scrobbling’ support for last.fm? I know it has been a while, but I finally got around to adding a keyboard shortcut for the “next song” it is now Ctrl + > (no shift so really) Ctrl + . I hope this helps. If you just run Jango Desktop two more times it should install the updates. (One time to check for new updates and one time to install them). hey….you should contact the jango creators/developers… to make your software a free oficial distribution… would be great….what do you think Samuel???? I also apperciate your kind words because it reminds me I should update the application. Any suggestions? Any updates for your efforts to port this app for Linux yet ? and why not put this project on sourceforge.net or google code, that might get you other people along to collaborate too. There haven’t been any efforts form me to port this application to Linux. I frankly do not have time or experience. Though I think you are right this application should be open source and maybe someone will convert it to Linux for you. Keep and eye open over the next we or so as I setup something. When I get the time. A ‘show what i’m listening to’ plugin for msn/live messenger would be cool, but the app as it is works very nice, I like that it just minimizes to system tray, I always use ur app when I’m gaming.. tnx! Thank you, its a great feeling knowing my applications get used. When I have some time I am going to convert the application to open source hopefully some other developers can start adding the new features users like you are requesting. if convert it to open source I’ll take a look at writing a feature like that, but I currently don’t have the time for that. have really come to appreciate my users like you who get joy out of my application. It makes me feel like my efforts have not gone to waste. That is why I want the best for my users. I have officially made Jango Desktop open source and it is hosted on Google code. Feel free to play around with it if you want. Any bit helps weather that’s graphics, coding, documentation or just spreading the word. I appreciate any help I can get and I hope that Jango Desktop will continue to evolve into an even better application. Have not used the software yet, will be in the future. I was just doing research to see if something already exists before I build my own :). . . It would be nice if you could have a semi-real time playable songs for various artists. Thanks for developing this software. Please try out the program and let me know what could be done. Also if you are into development the project is open source I would love to see some new developers join the project. Good program, but PLEASE change shortcuts to user-definable or an option to disable. I use Ctrl-Right for text navigation too much to allow a music player to hijack it. Sorry, but it’s no Jango Desktop for me until this is fixed. I understand your concerns. At the moment this is a high priority on my list of things to change/add I will make sure you are the first to know when this is done. Your idea of disabling shortcuts might be a good quick fix until I do get around to making them user customizable. Unfortunately Jango Desktop is developed in my spare time which I do not have a lot of these days, that is the reason I turned the project open source I do appreciate your input. Hey Sam! i use ur app soo much all my friends started using it.. now i was wondering if it would be possible to make it hook into last.fm scrobbler, cuz u already popup the sond info, so it shouldnt be that hard to hook it in their api. Hooking into last.fm scrobbler has been requested before. I have already noted it here http://code.google.com/p/jango-desktop/issues/list however I do not have a ton of time to develop these days so I am not sure when I will get to it. I think I will help you deleveping this software (project). by your permission, mind if I take the svn code located @ code.google.com ? n.b. I’m a C# programmer too, so this project interest me. You have my full permission, the project is completly opensource so please do take the code. I can shoot you an e-mail with my contact infromation if you want to work together. I would love your help as I just don’t have enough time these days.